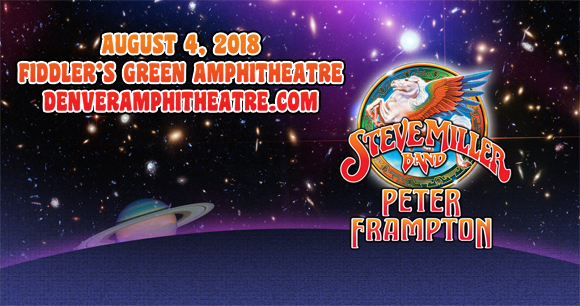 Ladies and gentlemen, tickets are now available to see the magnificent Steve Miller Band & Peter Frampton at Fiddlers Green Amphitheatre on Saturday 4th August 2018! This show is one of the most talked about events of the year, and you can see why – with hits like "The Joker" and "Baby, I Love Your Way", these veteran rock acts are legends of the industry! Grab your tickets now for an unforgettable show! British-American rock singer, songwriter, producer, and guitarist Peter Frampton has had a long career in music, beginning as a child singer and becoming a teen-heartthrob during his time as lead singer and guitarist of The Herd. After four studio albums and one live album with rock band Humble Pie, which he formed alongside Steve Marriott of Small Faces, Frampton embarked on a solo career. He released his debut album, Winds of Change, in 1972, but it was his 1976 live release, Frampton Comes Alive!, that brought Frampton wider commercial success and mainstream attention, selling 8 million copies and launching three hit singles. Over the years, Frampton has had several successful hits as a solo artist, including "Breaking All the Rules", "Show Me the Way", "Baby, I Love Your Way", "Do You Feel Like We Do", and "I'm in You". A prolific artist, he has released twenty solo studio albums to date.